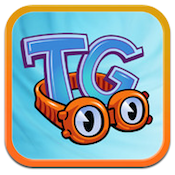 Toon Goggles is an iPhone app developed by Digital Media Interactive LLC. Toon Goggles can help iPhone users track down free, amusing cartoons for their kids to watch. Toon Goggles features 100% parent-friendly cartoons, organized into six different categories. 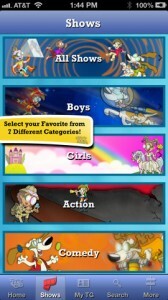 The categories are as follows: boys, girls, action, comedy, preschool, and educational. You can watch on your iPhone, or watch Toon Goggles on your Apple TV with Airplay. You can watch videos without having to register, which is great. Additionally, if you take the time to create an account, you will have the ability to see recently watched episodes, or resume videos right where you left off. It’s also worth creating an account because certain videos are restricted to registered users only. The videos themselves are high quality, both in terms of voice acting and animation quality. There’s a huge array of shows. While some shows only have a single episode uploaded so far, others have over 50…that means plenty of stuff to keep your kids quiet and entertained. Please note: your carrier may charge data fees, depending on your device’s plan. Unless you have an unlimited data plan, try to watch these cartoons over Wi-Fi so you don’t face overage charges. If you’re a family that’s “cut the cord” with the cable company, Toon Goggles is a great, free way to replace kid’s TV. It’s prescreened and determined to be family-friendly, making it a better choice for young kids than a Netflix streaming account. There’s also a handy “jump” button that simulates the action of flipping through the channels, allowing users to jump to a different episode of a different series. With the ability to store your favorite cartoon episodes into the app’s “Toon Box” for on-the-go, offline viewing, Toon Goggles is a great options for parents who need to entertain their kids. 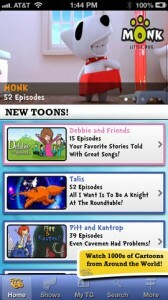 Toon Gogglesis compatible with iPhone, iPod touch, and iPad. Requires iOS 4.3 or later. This app is optimized for iPhone 5.